Adapted from Cook’s Illustrated-I love this dish because it’s totally low effort, delicious and you can cook side dishes while it’s in the oven. Don’t be discouraged by the lack of a crispy, brown skin…it’s different, but you won’t miss it too much. Take chicken out of fridge and bring to room temperature. Adjust oven rack to lowest postion and preheat oven to 250 degrees. Pat chicken dry, tuck wings under back and season with salt and pepper. Heat oil in Dutch oven over medium heat until just smoking. Add chicken breast-side down; scatter onion, celery, garlic, bay leaf, and your herb of choice around the chicken. Brown chicken lightly, about 5 minutes, then use a wooden spoon inserted in the cavity of the chicken to flip it over, breast-side up. Cook until chicken is nicely browned on bottom and the vegetables are caramelized, about 8-10 minutes. Remove pan from heat, place a large sheet of foil over pot, cover tightly wit lid and put in oven. Cook until you get a temerature of 160 in the thickest part of the breast and 175 in the thickest part of the thigh. For my 4 1/2 lb bird, this was about 1 1/2 hours, but begin checking after an hour as you don’t want to overcook. 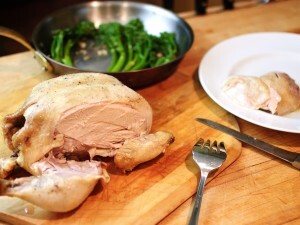 Remove chicken to cutting board and tent with foil. Rest for about 20 minutes before carving for the juiciest chicken. Meanwhile, use a slotted spoon to remove the solids from the pan, squeezing as much juice back into that pan as you can. What’s left in the pan is the “jus” and it’s a natural sauce for the chicken. You can serve the jus as is or pour into a fat separator, which I don’t do for this recipe. There’s usually not enough fat to worry about and it just tastes so good as is! Taste the jus for seasoning, you may want to add salt and pepper or a tsp of fresh lemon juice for flavor. Carve chicken and serve with jus. I served this with smashed potatoes and parnips so the jus was a perfect addition. This entry was posted in main dish. This dish was so good that our 14 year old went for seconds… Twice! Thanks!